Houzz 141 of our visitors have told a friend about this plan. This charming country home offers much more than just great style. It also features a floorplan designed for the busy lifestyles of families today. The large great room features a gas log fireplace, trayed ceilings, and provides a perfect place to entertain guests. The well-equipped kitchen features a raised bar, large pantry, and easy access to the neighboring dining room. The master suite features a large walk-in closet, dual lavatories, jet tub, separate shower, and enclosed toilet. The other three bedrooms all include large closets. This home also features great porch areas for outdoor entertaining and a large two car garage complete with separate storage space. Make this your family's next home! Question: How wide are the halls and stair case on this plan? Answer: Hello, The entry hall from garage is 4'-4" wide. The hall on the left and the stairs are 3'-8" clear width. Thanks. Answer: Hello, The basement is the same size and shape as the heated and cooled portions of the house, plus the storage room. There is basement under everything except the porches and garage. The biggest portion of the basement is 32'-6" deep by 64'-8"wide, plus another 32x3 section near the front porch, and other areas under the breakfast room offset, and entry hall/half bath/storage. Thanks. Answer: Hello, The space for the stairs is approx. 4 feet deep. It would require 5 feet for a bathroom, so you could use a foot from the great room depth, then shift the rear wall of the great room out onto the rear porch to regain the foot, or just have a smaller great room depth. The space could also be used to enlarge the great room, and/or the bedroom, or possibly a coat closet/and extra storage closet. Thanks. Answer: Hello, The right reading reverse option would flip the plan orientation, and the garage would end up on the left side. The great room ceiling is currently 9' around the perimeter, and 10' in the trayed ceiling area. It is possible to elevate it so that its 10' everywhere, or 10' and 11' in the trayed area. The great room ceiling height can be changed onsite with the builder. Thanks. Question: How much does the roof step up? Answer: Hello, The front porch beam is at 9' height. The roof above it is 14' height. There is about 18" of siding showing above the porch roof. The extra height provides extra headroom for the bonus room and gives it a good curb appeal. Thanks. Question: Is there a smaller plan that has this same look? Looking for 1,800- 2,000 sq. Ft.
Answer: Hello, Sorry, we do not have this exterior in a smaller version. Its difficult to cut the footage of this particular layout down below 2200 s.f. because of the symmetrical nature of the front. Removal of one of the bedrooms is also difficult, as there is no easy way to do that and keep the front looking similar. 1800 to 2000 s.f. is normally a 3 bedroom design. Thanks. Question: Modify to have wraparound porch. Question: Is the gas log fireplace the only option or can it be replaced by a real wood insert. Answer: Hello, You could use any type of fireplace. The non vented gas logs that we currently show is popular because its the least costly to build, and doesnt require a chimney. If you want to burn wood, just add a flue pipe type chimney covered with a wood frame and siding, or you could build a custom masonry fireplace onsite with brick or stone. This is something you can probably change onsite by talking with your builder, unless your permit office requires the plans to be changed. If so, we can provide a quote to modify the plans if needed. Thanks. Question: I left a message yesterday about plan modifications. What is the cost to modify this particular plan? We have a few several changes we'd like to make. Thank you. Answer: Please email us with a list of the changes you would like to have done and we will email you back with a modification quote and time frame. Thanks, Amanda ----------- House Plan Gallery, Inc. Question: Are there any pictures of the inside yet? Thanks! Question: How large is the island and the food pantry? Answer: Hello, The island is 9 foot by 4'-6" at the widest point. The pantry is 4'-2" x 4'-2", and could be built with regular stud walls and a regular door instead of as a cabinet style. Thanks. Answer: Hello, Basement is already an option for this plan. If you ordered the basement version, there would be another set of stairs going down underneath the stairs going up to the bonus room. So you could choose to simply not build the stairs going up, and delete the bonus room onsite. If you wish to recieve a quote to modify the plans, send me a list of everything you want to change, and I can provide you with a quote. Thanks. 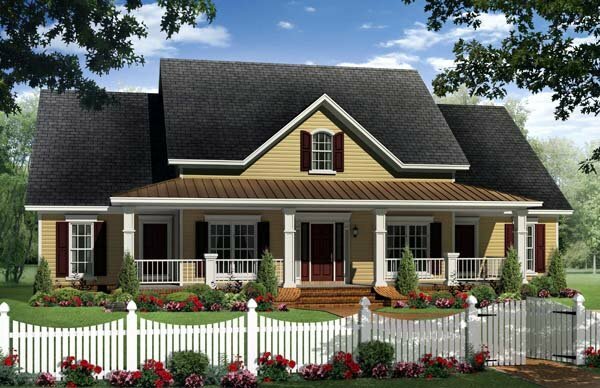 Question: Do you have this plan in a brick exterior? Question: Are those windows in the second bedroom and bath on the front of the house? 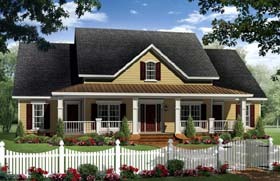 Question: Are there windows or doors on the front porch for bedroom 2 and the master bath? Click Here to download a free PDF Brouchure of Plan Number 59214.